Flaming type leather overlays have been around for as long as I have. What's cool here, is that there is no crazy contrasting color. Just that "crazy horse" looking leather. Tastefully embellished around the edges, we avoid the "bling" but keep some style. 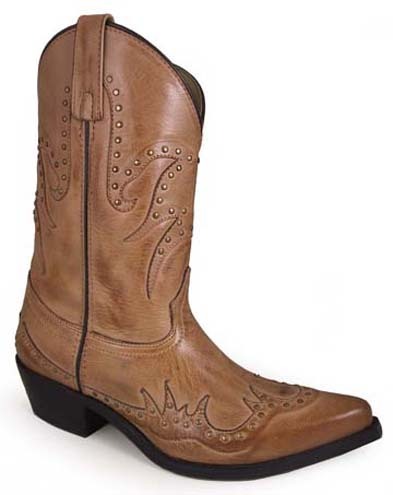 Typically this sort of ladies fashion boot is in limited editions, so if ya like it, Now's the time to order it. The real leather overlay, small bronze studs, and casual feel, make this "Donna" boot a great choice for both daily and "Ladies Night" dress. This boot just looks good with jeans, shorts, & skirts. And it is value priced for you. Did you know that the taller heel allows more arch support to be placed under your feet than conventional shoe heel heights? LEATHER: LEATHER with Manmade Lining.